This was the very first novelty cake I made. Well, that's not exactly true, because I did a practice cake first. I don't think I took any photos of it, and really, it was nothing to look at anyway. I didn't even bother to color the fondant, so it resembled a poorly formed igloo more than a teddy bear sofa. 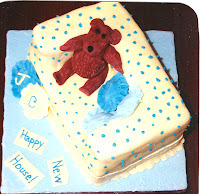 I made this cake years ago for some friends who were having a house warming party. I stole the idea from a special "Kids' Party Cakes" insert in a British cake decorating magazine, and it looked like something I thought I could do. Please forgive the odd edges on the photos. They were in a scrapbook of sorts before being scanned in. Yes, these pictures are that old. Anyway, here's what I was going for. You can see that the cake in the magazine is much more polished, but I think I came pretty close. Click the thumbnails for a larger view. This is such a cute idea and super fun cake to make. However, if I had it all to do over again, there are a few things I would do differently. I should've trimmed the cake so that the couch corners are nicely rounded. The ones on my cake are too square. I'm better at piping dots now, but I have too many on the teddy's sofa and most--if not all--have peaks. I'm also better at ruffling fondant now, so the skirt around the bottom of my cake would look more like the one pictured in the magazine. I made my teddy bear too dark. You can barely see his eyes and nose. I actually think the one in the magazine is a little too light to sit on such a yellow sofa, but I think an in-between brown would look better. I would have drawn the seams on the couch. I don't know why I didn't do this. I maybe didn't have the right tool or just forgot, but I think that's an important detail to include. The nice thing about a cake like this is that it's easy, and the colors could be changed to suit the occasion. 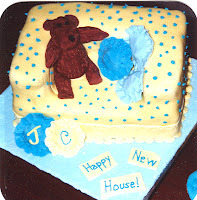 Originally intended as a kids party cake, mine was for a housewarming, and I think it would be a cute baby shower cake. The couch could even become a moses basket or a bassinet. If you have any thoughts as to how else this cake could be used or improved, please leave a comment letting me know.